Aside from a few aesthetic modifications like a repositioned fingerprint sensor, not much has changed from the S9+ that launched earlier this year. Inside, the Note 9 gets a water-carbon cooling system that seems to do little in terms of performance, an unsurprising result considering the phablet uses the same processor as Samsung's flagship smartphone. Aside from a larger display and S Pen support, the Note offers few additions over the S9 series. That includes cameras, which come straight from the S9+, though Samsung might have spent some time on software improvements to optimize image quality. 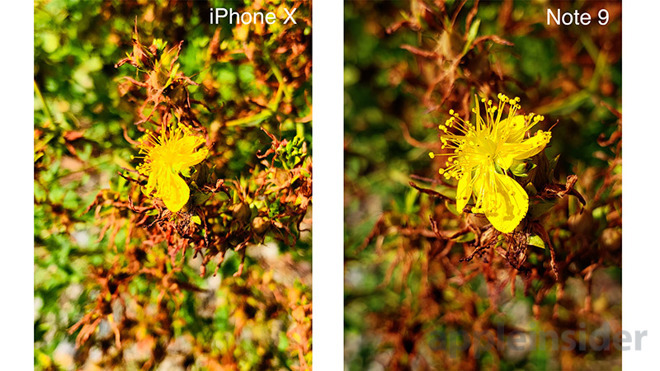 We already compared the iPhone X's camera to that of the S9+, but let's see if the Note 9 can improve on Samsung's showing. Starting with some Macro shots, we used the wide lenses of both phones and got as close as we could to the subject while keeping focus. We were able to get quite a bit closer with the Note 9 compared to the iPhone X. The Samsung actually showed us a little icon indicating that Macro mode was enabled, while the iPhone has no such feature. Running the same test with the telephoto lenses yielded similar results, as the Note 9 was able to get much closer to our subject while keeping it in focus. We noticed that the exposure on the Note 9 was better as well. Next we compared the f/2.4 and f/1.5 aperture modes on the Note 9, noting f/1.5 mode was a lot less detailed than the smaller-aperture f/2.4 mode. 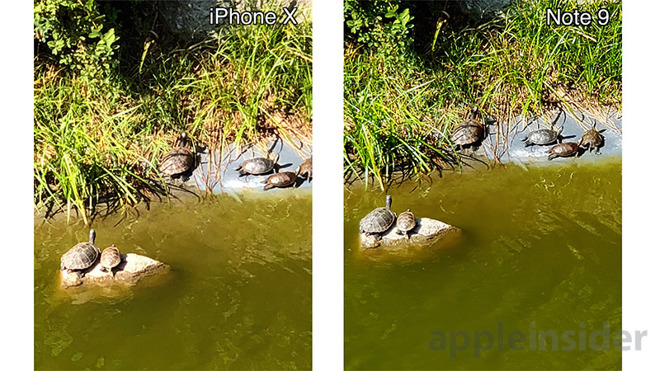 Interestingly, the iPhone X was sharper than both Note 9 modes despite boasting an f/1.8 aperture in its wide angle lens. One thing you don't get in Samsung's Pro mode is HDR, so we reran the previous test with Auto mode and noticed that the Note 9's HDR effect made the image look a bit fake compared to the same photo on iPhone X. The Samsung version was also bit blown out as well. Overall, colors and contrast look much better on iPhone. Both of these phones have their own Portrait and Live Focus modes to add artistic blur to an image. Unlike Apple's Portrait Mode, the Note 9 allows you to adjust the amount of blur in the background, but the feature can look a bit fake at maximum settings. 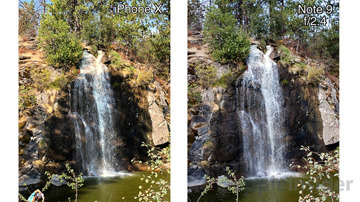 Comparing both photos, the iPhone looks a lot more realistic as far as blur edging. This could even pass off a shot from a DSLR camera, as long as you're not blowing it up to a larger size. One thing we do like about the Note 9 is that it adds simulated bokeh balls so it looks similar to what you get with a lens from a DSLR. Overall, however, the win goes to the iPhone X. 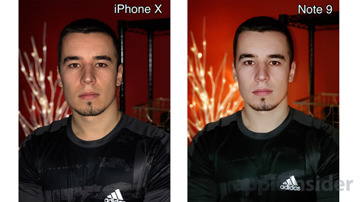 Comparing the blur effects of the front-facing cameras, the iPhone again looks a lot more realistic. 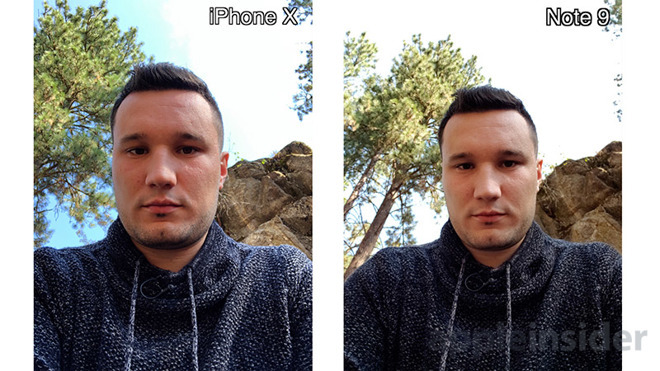 However, the iPhone X's photo had a bit too much contrast and we noticed that the Samsung has quite a bit of a wider lens for selfies. This latter feature is a plus for taking selfies with friends. 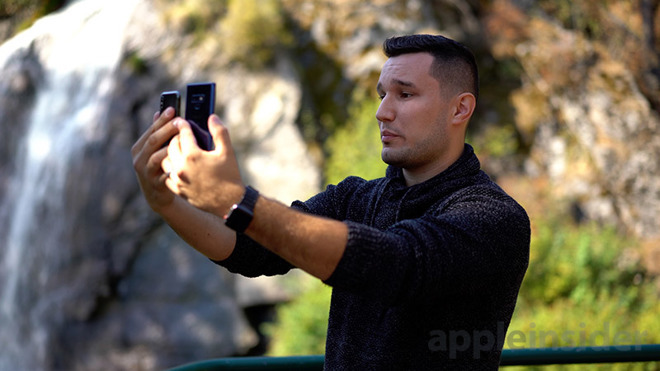 Not only does the Samsung have a wider lens for selfie photos, it also has a panoramic selfie mode which allows you to get much more of your background into your shot. It did a great job at stitching the shot together, we literally didn't see any artifacts or tearing at all. By default, the Samsung adds some skin blurring and smoothing in the form of the beauty face mode, and you can actually go into the settings and turn that off, so we did that and retook the test. Unfortunately, it still looks like some of it is being applied even if you move the slider all the way to zero. We noticed that the Note 9 actually turned the beauty mode back on even after we manually turned it off. So we tested one more selfie after turning it off again to compare detail. We can instantly notice that the Note 9 blew out the sky, where the iPhone X actually kept a lot of the blue in the photo. 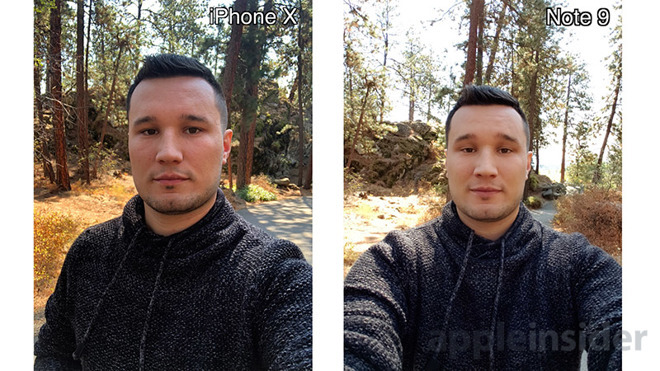 However, the colors on the iPhone X were off, because the sweater in the photo is actually grey, not blue. The Note 9 does a much better job at faithfully reproducing colors. 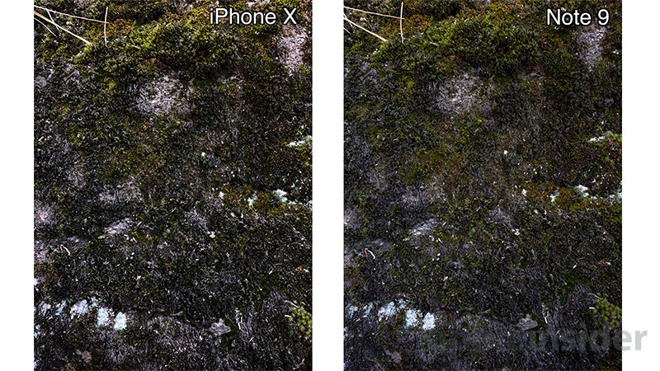 Both of these phones offer up to 10x zoom photos, so we decided to see which phone would churn out a higher quality image. The Note 9 seems to be better in almost every single way. The colors contrast and detail all look better. We performed another portrait mode test, except this time we saw how far away the subject can be while still triggering the feature. Both phones actually worked from around the same distance, except we noticed that the Note 9 added a pretty large amount of blur, looking almost unrealistic. The iPhone X seems to account for the distance you are away from the subject and it adjusts the blur to be more realistic. The blur edging around the camera and the face on the Note 9 isn't very good, so you can easily tell that it's applied with the help of software. We did a final detail shot with the wide lenses. Taking a closer look, the Samsung looks much better. The iPhone X has too much contrast in this shot, as well as some over-sharpening. The colors on the Note 9 look a lot more true to life. Back in the office, we took some photos in low light using the portrait and live focus modes. The Note 9 looks better exposed and brighter in auto mode, where both phones decided not to use flash. 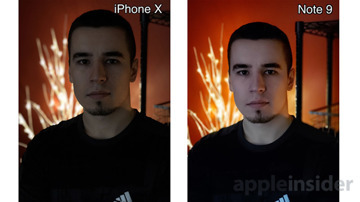 We manually enabled flash and the iPhone X looked quite a bit better. The Note 9 seemed to overexpose the face and the background. We switched to the wide lens and the iPhone X shot seemed to look a bit blurry. We took the same shot again and the iPhone X's photo still looked blurry compared to the Note 9. Finishing off our testing with a low light selfie in auto mode, we see neither phone is great. 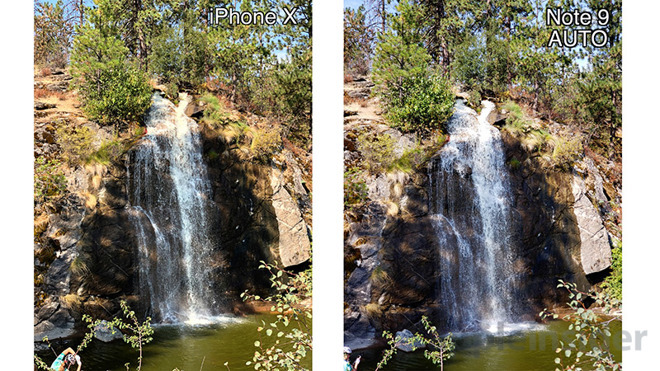 The Note 9 overexposed a bit, but its image was the winner, as the iPhone X's shot just looks a bit dark and loses detail. In conclusion, the Note 9 was definitely better for macro shots, as you can get quite a bit closer than you can with the iPhone X. The colors and contrast for those shots looked better on the Note 9 as well. 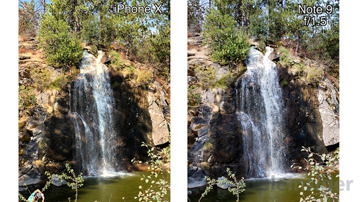 In general, the Samsung was better as contrast and colors compared to the iPhone X, except a few situations like the waterfall detail shots, where the Note 9 was a bit too cool. Surprisingly, the Note 9 did an outstanding job while at 10x zoom, beating the iPhone X in detail, exposure and colors. 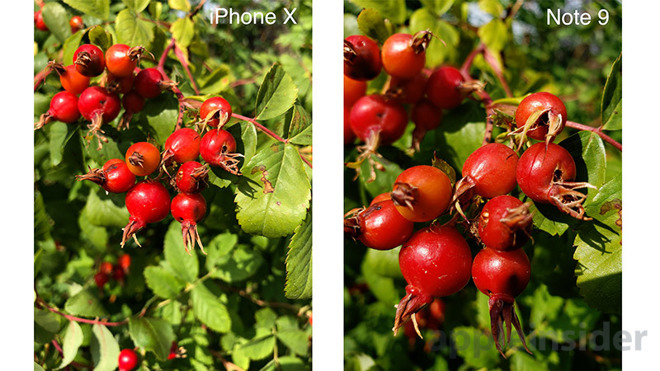 The iPhone X definitely beat the Samsung when comparing Portrait and Live focus modes. The blur edging was much more accurate and it looked really natural, whereas the Note 9 looked fake in a couple of tests. 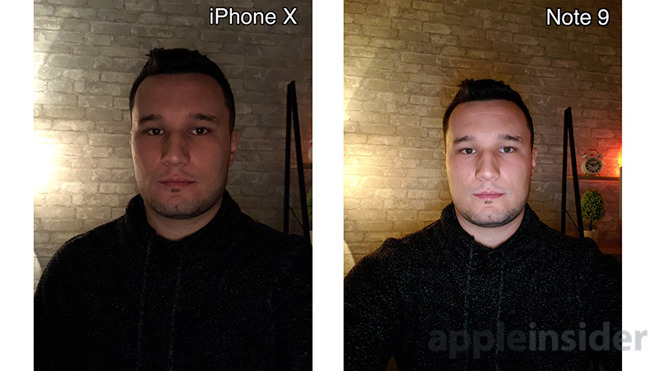 The iPhone X did a much better job for selfies, from everything including blur edging, colors and exposure. 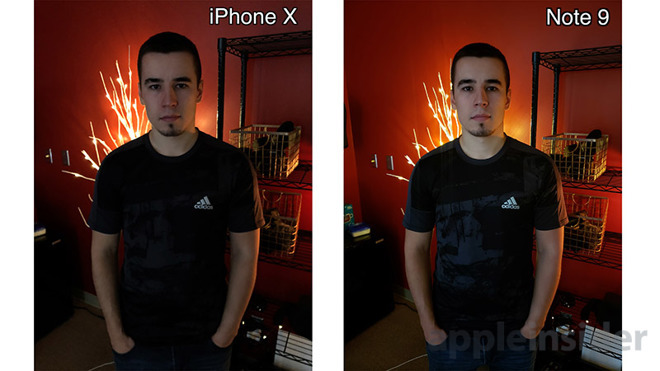 For low light, the iPhone X definitely looked a lot more natural thanks to the slow sync flash when it was used, but it had issues with sharpness when not using flash. Overall, out of the 15 main scenarios we looked at, the Note 9 came out on top, beating the iPhone X in 9 of them. We're very impressed with Samsung for its improvements in their cameras and software in recent years, now we'll just have to see what Apple has up its sleeve with the new 2018 iPhone lineup. 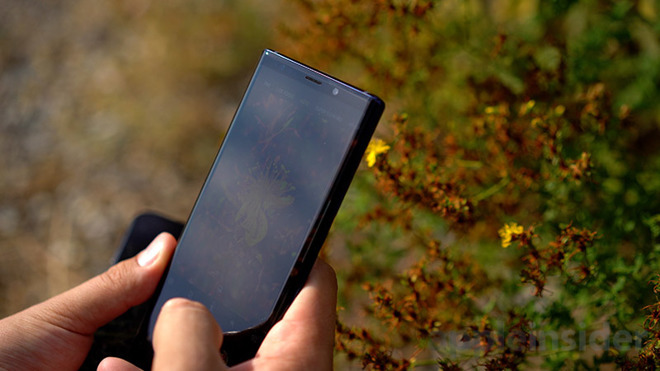 Shoppers looking to purchase the Samsung Galaxy Note 9 or iPhone X can take advantage of special offers at wireless carriers and electronics retailers. For those that want to purchase the Note 9 outright, B&H Photo is offering customers a free Samsung DeX Pad Dock and Qi Wireless Charger Duo valued at up to $218.99. The phone itself qualifies for free expedited shipping — and B&H will not collect sales tax on orders shipped outside New York and New Jersey. Samsung is also taking orders for the new device with free add-ons as well. Wireless carriers AT&T and Verizon are also offering buy one, get one free promotions on the 128GB Note 9.